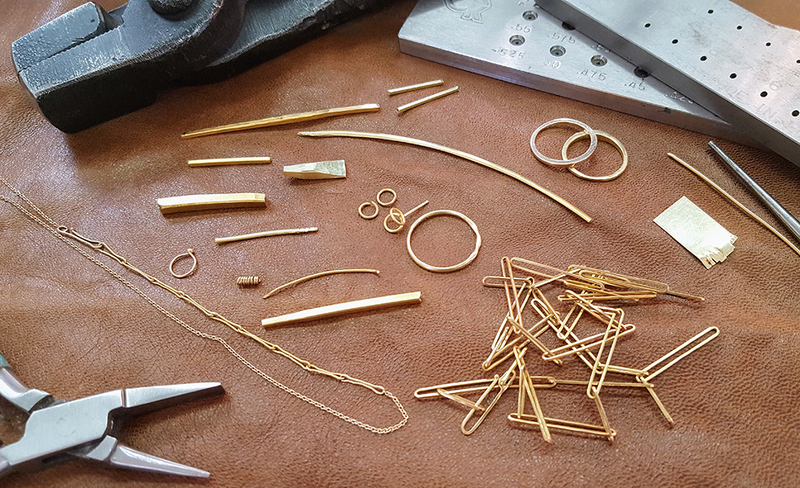 Give shape to your designs by finessing wire in this 8 session metalsmithing course. From heavy gauge to very fine, learn how to draw down and forge wire into the profile that is perfect for your project. You will be instructed on how to build a new piece of jewelry based on various linear elements. The course will begin by working with heavier stock and then decrease in size and application as the class progresses. Each project will utilize different forming and finishing techniques and require more precise soldering as the wire becomes more fine. Twisting, forging, looping, and doubling will give your designs the variety you are looking for. Two rings, earrings, bracelets, chain making, and metal alloying will be covered. This course is designed for gold and silver, but students may work in copper and brass if preferred. This is an open level class, basic jewelry fabrication skills are required.